Water is an essential thing for our daily living whether drinking water or consuming water. Everyone needs the highest quality water for themselves and their families. We want to meet your needs in order to consume perfectly pure water. 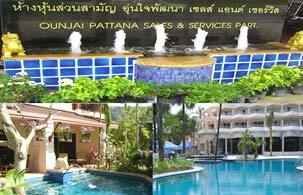 Ounjai Pattana Sales & Service General Partnership, our business has been growing till today because of the quality. With over 10 years experience, we aim for developing about water treatment system for consumption of hotels, industries and households. We create our products and find new technology to deal with the water problems in all conditions such as rusty water, gas water, hard water, brackish water and salt water. We are able to treat water to be high quality consuming water. Besides, we focus on developing our team and services for every client to be satisfied in our services. Water filters such as Reverse Osmosis system, UV water filter and numerous sizes of stainless filter tank. Pumps: set of pressure pump, piping pump, pump using for good and polluted water etc. Equipment of swimming pool system, filter and swimming pool lighting etc. Design and installation for water treatment system as well as water filters for households, hotels including all kinds of industries. Design and installation for swimming pool system, spa pool, sauna, stream, waterfall and fountain etc.